KKR will face Sunrisers Hyderabad in the second qualifier on Friday. Kolkata Knight Riders won the match by 25 runs against the Rajasthan Royals at Eden Gardens, Kolkata. Andre Russell was awarded the Man of the Match for his exceptional match-winning all-around performance that led Kolkata Knight Riders to the Qualifier-II. Team Circle of Cricket gets down to list the 5 talking points of the match. Kolkata Knight Riders started off their innings at a slow speed scoring only 46 runs in their batting powerplay despite having Sunil Narine and Chris Lynn in their dugout. The top order of Kolkata Knight Riders went out early due to a great bowling effort by Krishnappa Gowtham. Krishnappa Gowtham picked up a wicket in each of his first two overs to trigger a top-order collapse. Jofra Archer added to KKR's troubled by taking out Lynn cheaply. Kolkata was fighting on 51 for 4 down in 8 overs. 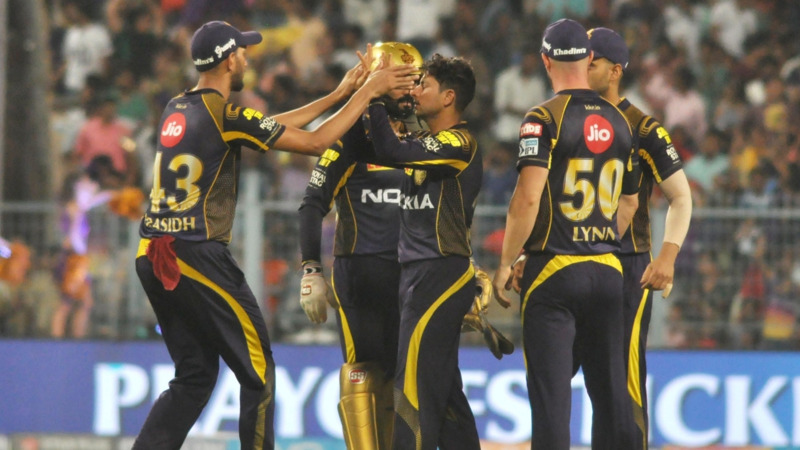 The skipper of Kolkata Knight Riders, Dinesh Karthik, and the young Shubman Gill gave KKR a sigh of relief after hammering a partnership of 55 runs for the 5th wicket partnership. Skipper Dinesh Karthik out on a half-century stands with Shubman Gill to help KKR recover. Both the players have been brilliant on the field, rescuing the home team in front of Rajasthan Royals in a knockout match. Shubman Gill has had a very wonderful tournament scoring runs for the team whenever in need. Dinesh even scored another half-century to strengthen his side. Andre Russell played a crucial knock, in the end, taking his home team to a comparative total of 169 runs after 20 overs. When others were getting out, Andre Russell stuck to his crease scoring those pivotal boundaries at the end of the innings and carrying his team to a total of 169. Andre Russell hit a brisk, unbeaten 49 to propel KKR to a healthy 169. Kolkata Knight Riders scored 55 runs in the last five overs of the match at a score of 11 runs per over. While chasing 170 to qualify for the next stage, RR had to build a partnership on the top to stir their innings. Ajinkya Rahane with Rahul Tripathi were very confident at the start of the second half. They scored 47 runs for the first wicket partnership after Rahul Tripathi fell to Piyush Chawla. Tripathi aided a brisk start for RR by contributing a valuable 20 off 13. Rahane set the tone of the chase for Rajasthan Royals with his valuable 46 runs. 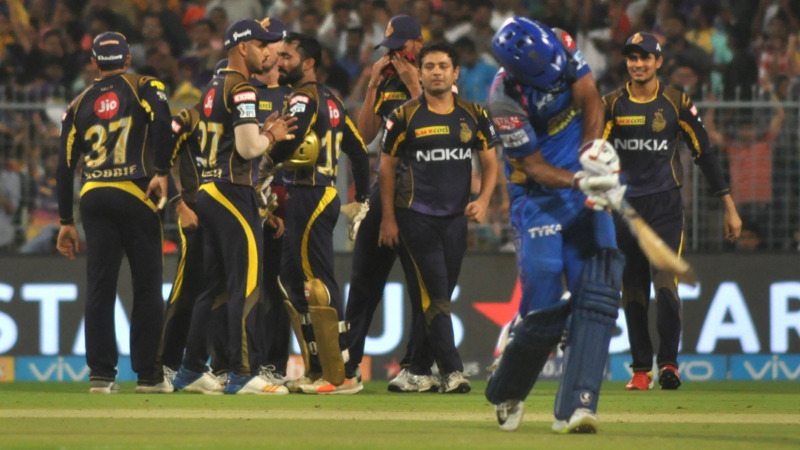 Kolkata Knight Riders did a great job stopping Sanju Samson who very effectively hitting the ball all over the park. The spinners of Kolkata made sure Rajasthan dance on the field and lose wickets in a hurdle. Kuldeep Yadav broke the Rahane-Samson stand with the wicket of the RR skipper. Rajasthan batsmen got out at a crucial stage whereas the home team took advantage of the pitch slowing down. Kuldeep Yadav broke the Rahane-Samson stand with the wicket of the RR skipper. Kolkata Knight Riders successfully beat Rajasthan Royals in the eliminator match by 25 runs to qualify themselves for the second qualifier to be played against Sunrisers Hyderabad on 25 May. A brilliant bowling performance from KKR bags a convincing victory over RR in VIVO IPL 2018. Rajasthan Royals are now officially eliminated from the tournament after losing and creating a mess out of their batting line-up. The winner of the second qualifier will have to compete against Chennai Super Kings who already are in the final.